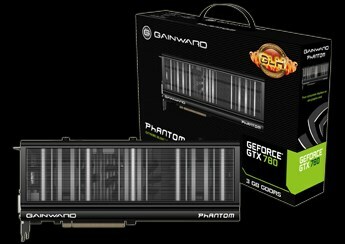 Gainward introduces the GeForce GTX 780 Phantom GLH. The card's suffix stands for "Goes Like Hell", which refers to the model's overclocked frequencies. The GTX 780 Phantom GLH is clocked at 980MHz, with a 1033MHz Boost and 3GB GDDR5 with a frequency of 6200MHz, similar to the Palit GeForce GTX 780 Super JetStream that was revealed earlier today. The new Phantom cooler design of Gainward GTX 780 Phantom series comes with "Removable fan" – each fan body can be removed to clean if necessary. Five pieces of 8mm heat pipe soldered by copper base help the GTX 780 dissipating the heat away from GPU easily and staying at very low acoustic level. In addition, 8-phase PWM with DrMOS for the GTX 780 core not only delivers extremely over-clocking capability but also offers higher efficiency. You can enjoy the massive power from the board without wasting power.